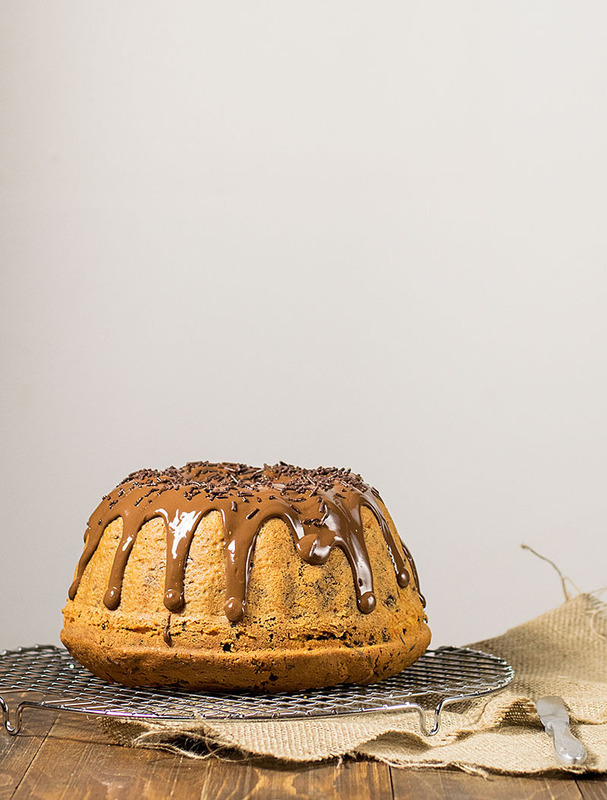 Is there anyone who doesn’t love a good bundt cake? I don’t think so! 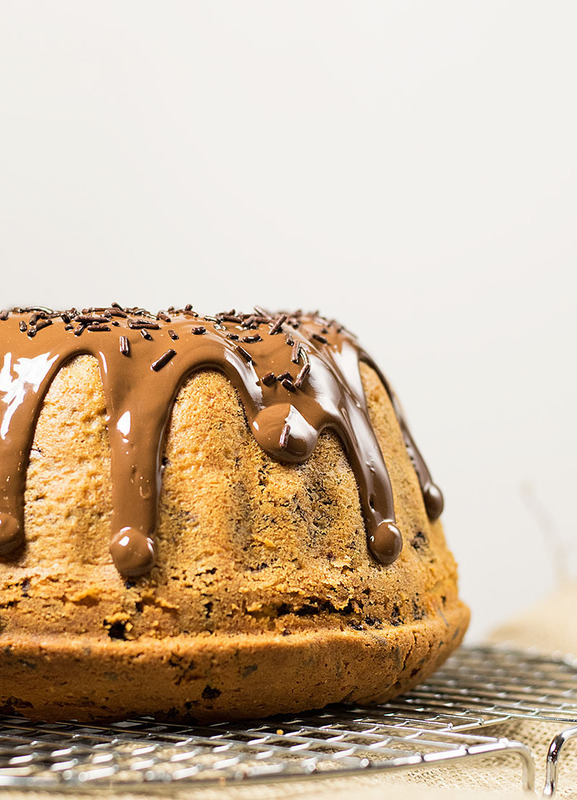 But what makes a bundt cake really good? For me the answer is simple. It must have a buttery smell mixed with the exotic aroma of vanilla. It must be fluffy and tender. It should taste sweet, but not overly sweet, so that you can eat it any time of the day! It must have a golden brown, caramelized exterior to contradict the pale yellow and soft interior! And of course it must be simple and easy to make! 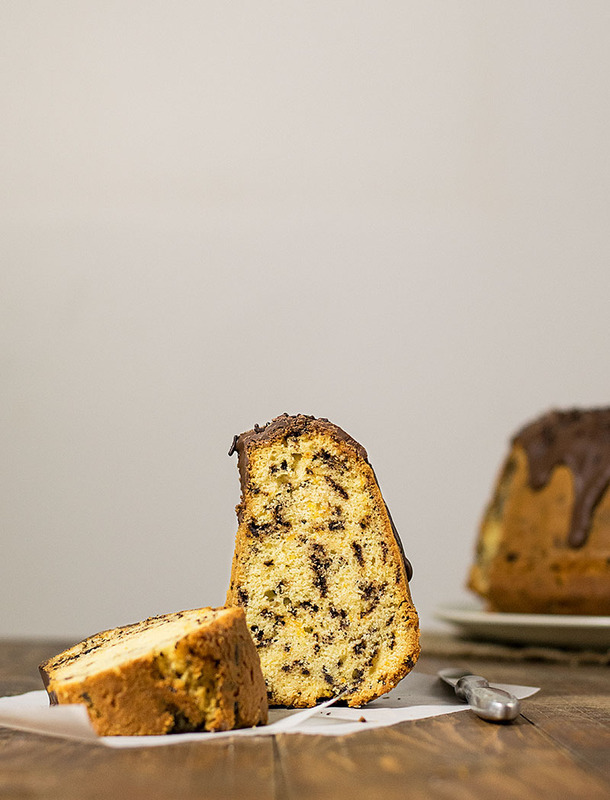 I believe this recipe is all that and little more, because it incorporates some (real) chocolate sprinkles for a twist in flavor and appearance! This recipe is probably one of the most known recipes in my country, and you can actually find it on the back of several flour packages. The quantities are measured by cups, meaning it’s easier to follow, though a little less accurate (especially when measuring the flour). Thankfully, it is also a forgiving recipe, so even if you measure a bit more or less flour, it will still turn out delicious! Except from the chocolate sprinkles I ‘ve also added a grated carrot. It’s always a good idea to add some type of vegetable in your food whenever you can, and the carrot is perfect because it releases extra moisture to the cake without affecting its taste. To make this cake you will use the creaming method. What that means is you’re going to beat the butter with the sugar until very fluffy and pale in color, and then you’ll add the eggs, one at a time, until they’re totally incorporated into the mixture. Afterwards you’ll mix in the milk and the flour. From what I’ve seen so far, the creaming method is the one used more often though it does not produce cakes as tender as the one bowl method. I believe that there are mainly two reasons for this. 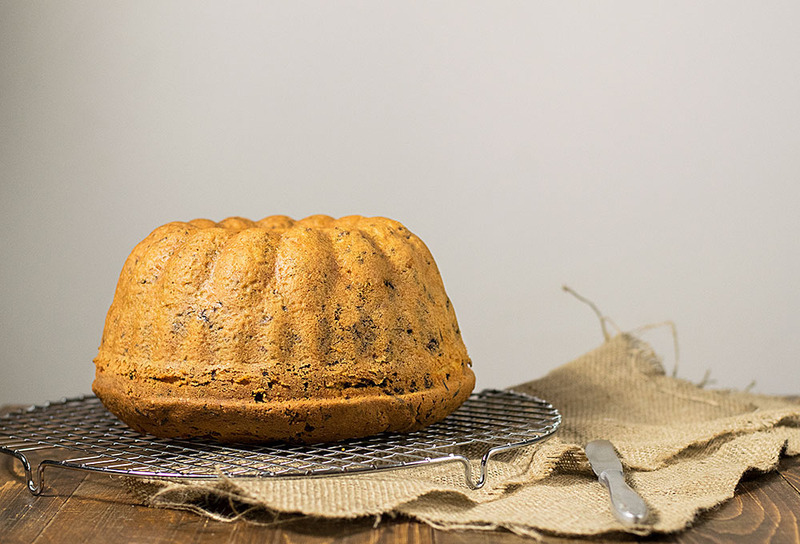 Firstly, the creaming method is more suitable for cakes with more height – such as bundt cakes – because they need some structure to support their weight. Secondly, it’s a bit more forgiving, thus having more consistent results. Without analyzing this further, I’ll just say that I prefer the creaming method for everyday bundt cakes, cakes I can wrap in foil and take them with me at work, whereas I’ll use the one bowl method for special occasion layer cakes, like this awesome Xmas scented Cake with fluffy vanilla buttercream which I make all year round and not just during Christmas! Make sure all the ingredients are at room temperature and the butter is very soft. This helps the cake mixture to homogenize more easily. You can omit the carrot if you want or you can use a grated apple instead, though it will make your cake a bit darker in color. After adding the flour, take extra care not to overmix the batter since overmixing can result in a tough cake. If you’re thinking about eating this cake for breakfast – as I often do – eat it with this super foods smoothie and kick start your day! 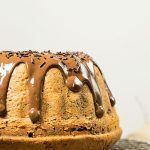 A delicious vanilla bundt cake recipe with a twist. Chocolate sprinkles add a nice color contrast and tiny bursts of chocolate flavor! 3.5 oz (100 grams) chocolate, 55% cocoa, finely chopped. Combine the flour, cornstarch, and baking powder in a bowl. Beat the butter, sugar and a couple tablespoons of flour in a large bowl using your electric mixer. (Adding some flour to the mixture will later help the eggs to mix more properly). When the mixture is very light and fluffy, add the eggs, one at a time, beating well after each addition. Add one third of the flour and mix gently with a spatula. Add half of the milk, mix and repeat with one third of the flour, the rest of the milk and the rest of the flour. Add the carrot and the sprinkles and mix until just combined. Pour the mixture in the pan and bake for approximately 50-55 minutes or until a toothpick inserted in the center comes out clean. Wait 10 minutes to cool, invert onto a rack and cool completely. To make the ganache, heat milk, hazelnut butter and chopped chocolate over very low heat, until melted. Let it cool and thicken a bit, and pour over cake. Sprinkle some chocolate sprinkles.